Have you ever lost your computer, had it stolen or accidentally erased your computer’s music? 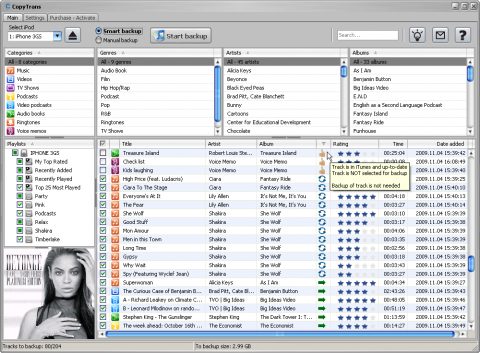 In those times, you’d probably wish you could recover your music from your iPod or iPhone! Fortunately I’m presenting you with the solutions that will allow you to do just that! Super easy, hassle free: CopyTrans 4! Why should you want to install CopyTrans? Your brand new Netbook was a tad too flashy and a stranger decided to “borrow” it. For all these common situations, CopyTrans is your lifesaver! CopyTrans is a simple backup utility for the iPhone, iPod and iPod Touch. It will, in one click, backup your music, videos, TV-shows, podcasts, ratings, artworks and all other track information directly back to your iTunes or in a folder or external hard drive on your PC. What’s new in CopyTrans 4? CopyTrans 4 was released for public download on December 1st 2009. The best new feature is that CopyTrans 4 now imports tracks up to 16x faster into iTunes. BackupHowTo readers will especially like the new “Smart Backup” mode. Using it, CopyTrans 4 will only transfer necessary tracks and information making sure no duplicate is created in your iTunes library. The new version of CopyTrans also supports Voice Memos, Home Made Videos, MMS Videos, Smart Playlists as well as all the track information (track meta data). It is compatible with absolutely all iPods, iPhones and all generations of the iPod Touch. CopyTrans 4 is compatible with Windows 7, both 32 and 64bit versions. There are two ways to install CopyTrans 4. The first one is by using the CopyTrans Control Center. It will allow you to launch CopyTrans 4 and will alert you of any updates made available. But if you prefer you can download the standalone CopyTrans 4 archive. Just unpack it anywhere on your drive and run it. The entire application fits in a 2.7Mb zip file. My personal opinion is that CopyTrans 4 is a major improvement over an already outstanding application. Not only does it drastically simplify the recovery of one’s iPod or iPhone but it also does so much faster. CopyTrans 4 is released as a free upgrade for existing clients who purchased less than a year ago and priced at $19.99 for new users.